Her Excellency Jasmine Elise Huggins, began her career in the Foreign Service of St. Christopher (St. Kitts) and Nevis following her graduation from Howard University School of Law in Washington, D.C. 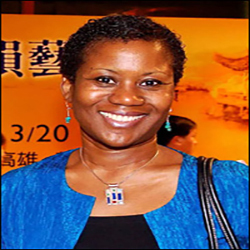 In December 2007, Ambassador Huggins was tasked with establishing the Embassy of St. Kitts and Nevis in the Republic of China (Taiwan) and after two years in her position as Chargé d’affaires, H. E. Jasmine Elise Huggins was appointed as Ambassador Extraordinary and Plenipotentiary of St. Kitts and Nevis to the Republic of China (Taiwan). In addition to seeking trade, cultural and other economic benefits for the Federation at her assigned post, Her Excellency inter alia, promotes and strengthens the bilateral relations between the Republic of China (Taiwan) and St. Kitts and Nevis. Prior to the posting in Taiwan, Ambassador Huggins served her country in the Embassy and Permanent Mission of St. Kitts and Nevis in Washington, D.C. As Alternate Representative to the Organization of American States (OAS) and part of the CARICOM Alternates group, Ambassador Huggins was often called upon to take the lead in negotiating Inter- American declarations, conventions and resolutions in the Councils and Committees of the OAS. Her Excellency also facilitated technical cooperation and resource flows from the OAS to projects in the Federation, and successfully chaired the Working Group of the Inter-American Council for Integral Development to revise the Manual and Rules of Procedure of the OAS Scholarship and Training Program. H.E. Ambassador Huggins has professional experience and affiliation with the associations of The United Methodist Lawyers Guild and Maryland State Bar Association, and has been a Judge of American University International Law Human Rights Moot Court Competition. H.E. Ambassador Huggins has also served as Secretary-General of the Diplomatic Corps in the Republic of China (Taiwan). Ambassador Huggins is an avid hiker and enjoys reading and engaging in artistic and cultural pursuits.